Not every part of Tokyo is flashy. Many parts are anything but. Artist Ryota Hayashi not only shows the cityscape, but parts of Tokyo that are away from the crowds and chaos. 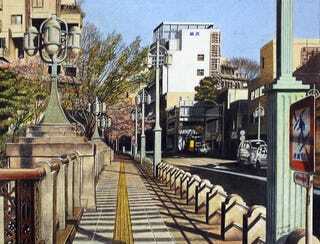 Using colored pencils, Hayashi focuses on Tokyo and its surrounding suburbs. His tranquil sketches give a quiet dignity to the areas. Have a look at his work (via Curazy). For more, visit the artist’s Facebook page. In case you missed it, check out Kotaku’s FAQ on visiting Japan.